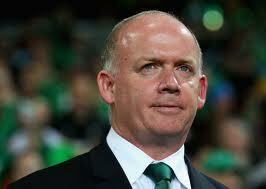 Ireland rugby coach Declan Kidney. You can make a beef burger from horse meat as we are now discovering in Ireland, but you can’t make a silk purse out of a sow’s ear. That’s something to consider as the nation reflects on last weekend’s glorious but hard earned win over Wales in Cardiff and looks forward to this week’s visit of England to Dublin. A week ago many felt, including myself, that Declan Kidney was under real pressure as Ireland coach going into the new Six Nations season. On Saturday afternoon, ahead of kick-off at the Millennium Stadium on the other side of the Irish Sea, television and radio pundits were openly predicting the beginning of the end for the genial Corkman whose contract expires in the summer. By halftime, with Ireland 23-3 up thanks to some brilliant play from Brian O’Driscoll and some incredible footwork from Simon Zebo, Kidney’s job was safe and his team were favorites for the Grand Slam. Nothing is ever as easy as that as Kidney well knows. Wales produced a stirring second half fight back worthy of their role as 2012 Grand Slam winners, and Ireland were put to the pin of their collars for the final 30 minutes in Cardiff. Not even the yellow cards awarded to Rory Best and Conor Murray could deny the Irish, however, and they held out for an eight point victory that owed more to second half defensive efforts than first half offensive genius. The win, as Kidney also knows, was all that mattered last weekend. It means Ireland can still achieve Grand Slam status this season, a fate already beyond the mighty French after their collapse in an incredible game in Rome on Sunday. With the win, however, comes the danger of expectation, the commodity that has crippled so many Irish teams in so many sports over the years. At halftime on Saturday, Ireland had been installed as red hot favorites to beat England and France at home and Scotland and Italy away in their remaining Six Nations games this season. By full-time, they were being tipped to give the Grand Slam a real good go, provided they can get past England at the Aviva this Sunday. The truth about this current Ireland team is, of course, somewhere in the middle of that expectation graph. They were, to be fair, brilliant in the first half on Saturday when the grace and guile of O’Driscoll and the youthful exuberance and cheekiness of Zebo offered real hope for the immediate future. Kidney, however, is unlikely to read too much into that opening 40 minutes and Ireland’s ability to punch holes in the Welsh defense at will. He will take more consolation from the manner in which the Irish, down two men at one time in that frantic closing quarter, stood up to the Welsh revival and soaked up all the fire on offer from the Dragons. Ireland were always going to score tries in this Six Nations. You can’t but be confident on that front when you have players with as much pace and vision as Zebo, Gilroy, Kearney and O’Driscoll playing behind Sexton and Murray. The question mark going into the championship was always going to surround their ability to stand up to physicality, to mount sustained defense against the best teams in the Northern Hemisphere. They were able to live with Wales at their toughest in the second half last weekend, and that has to offer hope for the English game this Sunday. But Kidney knows better than anyone that Ireland has to take it one game at a time from here on in. There is no point whatsoever getting carried away with a win in Cardiff, albeit the first since the Grand Slam Saturday of 2009. That game is history now and the headlines already confined to the fish and chip shops where horse burgers might also be on sale. The hard work starts again against England on Sunday – and only 100 percent Irish beef will get a result in that one! (Cathal Dervan is sports editor of the Irish Sun newspaper in Dublin). LANCE Armstrong’s fall from grace has been the biggest sports story of the year so far, the biggest for many years even, but a rival for the 2013 award landed on our desks on Monday. Europol, the European body for policing, announced at the start of the week that it is investigating match fixing in professional football and is currently scrutinizing some 680 games played on the continent. Betting syndicates in the Far East are believed to be behind the scandal, with reports that they made a profit of some €8million on a €2million investment in recent seasons. That figure, however, is only the tip of the iceberg as far as the investigation is concerned. Some experts say the Far East criminal gangs could even turn over more annually than sportswear giants Nike in their illegal trade. The reports say they have targeted players and referees in their efforts to fix matches and police believe the problem is far more widespread than many would believe. One game already under investigation is Liverpool’s Champions League qualifier against the Hungarian side Debrecen in 2009 when a Dirk Kuyt goal proved to be the only score in the match at Anfield. It has since emerged that the Debrecen goalkeeper was bribed to concede three or more goals in the game, but Liverpool couldn’t manage that many goals in the match. What that says about the Liverpool forwards on the night, including one Fernando Torres, is another story. But there is little doubt that this match fixing scandal is serious and threatens the very fabric of the game with hundreds of players now cast under a cloud. Proving it is going to be the hard thing but professional football has got to sit up and take notice of this scandal. SOCCER: The madness continues. Nottingham Forest parted company with manager Alex McLeish on Tuesday, just six weeks after they sacked Sean O’Driscoll at a time when they were still in the top five of the Championship. McLeish couldn’t see eye to eye with the club’s Kuwaiti owners apparently and is now out of work. Who would want to be a football manager and who would want to take charge at Forest? Roy Keane apparently, so watch this space. GOLF: Padraig Harrington was blown away by the crowds at the Phoenix Open over the weekend when over 500,000 fans attended the noisiest tournament in golf. The par three 16th is the loudest hole in golf, and tournament debutant Harrington now knows just why. He’s promised to return next year to make some more noise after a top 10 finish returned him to the top 50 in the world rankings, something to shout about. RUGBY: Rob Kearney won’t be following Jonathon Sexton’s lead after announcing that he is to stay put with Leinster after agreeing a new deal with the IRFU. Just last week Kearney admitted that Ireland’s top players would be tempted by the sort of money Sexton will earn with Racing Metro in Paris, but clearly home is where the heart is for the full-back from the Cooley Peninsula. SOCCER: Mick McCarthy had such a bad dose of the flu on Saturday that he stayed away from the Ipswich game at home to Middlesbrough and left his assistant Terry Connor in charge. The end result – Ipswich won 4-0. And Mick felt a whole lot better watching from his sick bed on a special TV feed of the game. RUGBY: Conor Murray told reporters at the Irish rugby team press conference on Tuesday that he can’t wait to taste victory over England in the Six Nations. The Munster youngster has yet to experience such a feeling, so Sunday’s game at the Aviva Stadium would be the perfect place to break that duck. SOCCER: The waiter in a coffee shop next to the Northern Ireland team hotel is set to make his debut for Malta in Wednesday night’s friendly in Valetta. I kid you not. His name is Jacob Borg and he is half-Australian and half Maltese. SIMON Zebo’s flick in the lead-up to Cian Healy’s try against Wales on Saturday is already the stuff of YouTube legend, so you should get to see if you haven’t already done so. More importantly, Zebo’s all around contribution against the Welsh was just brilliant and offers real hope of an Irish upset against England in Dublin this coming Sunday. Now that’s something we’d all enjoy. THE GAA have decided that Kerry’s NFL game against Dublin in Killarney will clash with the Ireland-England rugby game on Sunday which doesn’t do anyone a favor. GAA fans in the Kingdom will have to rush out of the game to catch the second half of the rugby, or stay away from the Division One fixture. No one wins thanks to a complete lack of common sense in this instance.